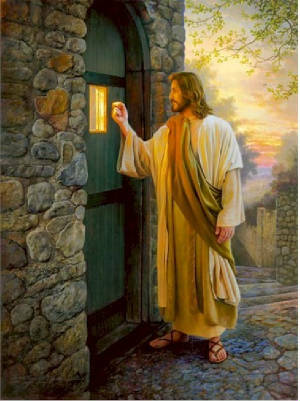 Jesus knocks at the door of our hearts. Most theologians say God has NO BODY and thus NO gender. I list the following verses from Revelation showing God sitting on his throne. Obviously, GOD MUST have a body. It insane to imagine we are given this extensive view of God and his throne, unless GOD DOES IN FACT HAVE A BODY! With the repeated use of the masculine pronoun we know that God is a male. GOD IS A SPIRIT, WITH A SPIRIT BODY. AND CHRISTIAN BELIEVERS WILL BE THE SAME WAY AFTER THE RESURRECTION. Granted, the Revelation involves John's vision, BUT, it IS God's WORD and IS TRUE. See my other web page for details that God is true male person -- GodIsAStraightMale.com.